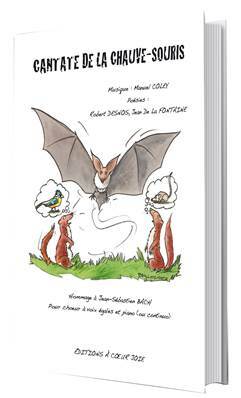 This cantata for children voices and piano is based on “La chauve-souris” by Robert Desnos and “La chauve-souris et les deux belettes” by Jean de La Fontaine. These two texts are mixed in this song and the singer and the listener follows the story of this funny bird-rat. He tricks his predators with his two forms (bird and mammal). This Chauve-Souris is happy and clever, she has more than one trick up her sleeve and the two weasels are completely lost. This cantata is an original and innovative way of discovering Bach’s musical style. Manuel Coley says himself he is a “musician-craftsman” and works on the development of children’s collective singing practice, on educational training and on the creation of a repertory for children’s choirs for “Voix d’enfance” in Abbaye aux Dames de Saintes, Charente Maritime.